In spite of what can be characterized as the “red tide effect,” figures released by the Sarasota County Tax Collector’s Office show that in the 2018 fiscal year, the county once again set a new record for “bed tax” collections. Data collected through Sept. 30 — the last day of the 2018 fiscal year — show the total Tourist Development Tax (TDT) revenue was $22,726,759. The figure for the 2017 fiscal year was $21,359,570.21. In 2016, it was $20,131,797.06, according to the figures released by the Tax Collector’s Office. Officially, through Sept. 30, the county had collected $1,530,202.37 more in TDT revenue than it did in the 2017 fiscal year. The 5% “bed tax” is charged on accommodations rented for six months or less. Although the overall increase from the 2017 fiscal year to 2018 was about 6.4%, the TDT collections for September were down $347,663.74 year-over-year. However, the figure for August was revised to show less of a decline, compared to the revenue total for August 2017. The latest data puts the August revenue at $882,739.49, which is $218,503.09 less than the figure for August 2017. In the previous Tax Collector’s Office report, the drop year-over-year was $228,638.55. The September collections totaled $732,643.21, the report says. In September 2016, the figure was $858,699.51, while in September 2015, it was $791,603.95; in September 2014, it was $670,263.27. And in another change with the latest report, the April collections went back into “positive” territory, showing an increase of $1,751.53 for that month, year-over-year. The previous report showed a decline of $22,082.01 in the figure for April of this year compared to the total for April 2017. 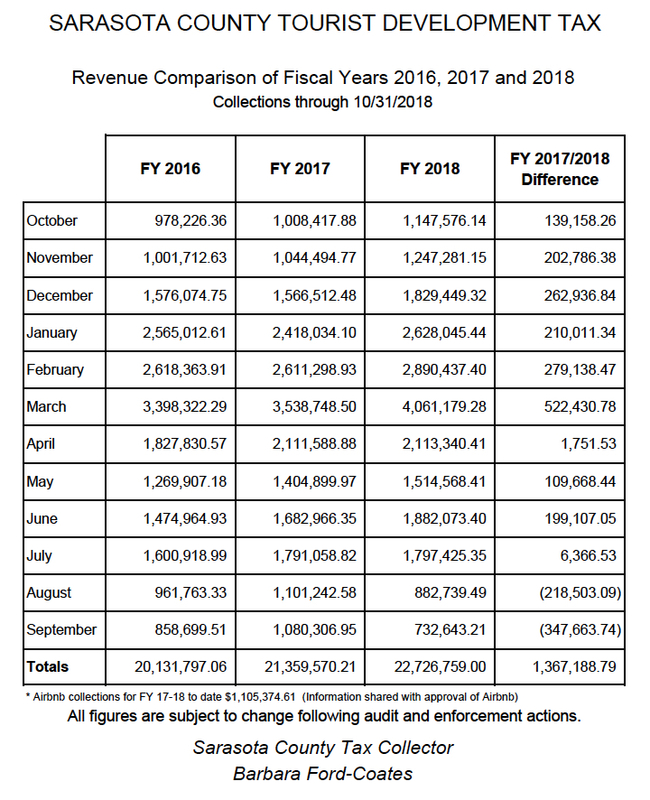 As Tax Collector Barbara Ford-Coates has explained to county leaders, audits and other enforcement actions can lead to revisions in the numbers from month to month —sometimes well after a fiscal year has ended. The latest data show that March was the month with the highest TDT total during the 2018 fiscal year: $522,430.78. That number also had been revised upward from the previous report, which showed the March total at $486,866.12. Additionally, the most recent data show that August and September were the only months with year-over-year declines. Sarasota County reports have noted far more negative impacts from red tide in August than September in terms of fish kills and other problems, such as respiratory irritation produced by the aerosols linked to the red tide algae, Karenia brevis. The county website says that, since Aug. 1, workers have collected more than 255 tons of debris from the beaches. The county reported that 173 of those tons were picked up in August. During the October Tourist Development Council meeting, Virginia Haley, president of the county’s tourism office, Visit Sarasota County, indicated that one bright spot for the community for September was the World Masters Rowing Regatta, conducted by the Fédération Internationale des Sociétés d’Aviron (FISA) at Nathan Benderson Park.Representatives of FISA, which is the governing body of the sport of rowing,told Stephen Rodriguez, president and CEO of the Suncoast Aquatic Nature Center Associates (SANCA), which manages Benderson Park, that the regatta was the largest FISA ever had held outside Europe. More than 2,000 people attended it in late September, Rodriguez told the County Commission on Oct. 23. Later that same day, Christine Johnson, vice president of the Board of Directors of Visit Sarasota County, pointed out to the County Commission that red tide had led to sharp drops in hotel occupancy and the average daily rate for rooms in September. 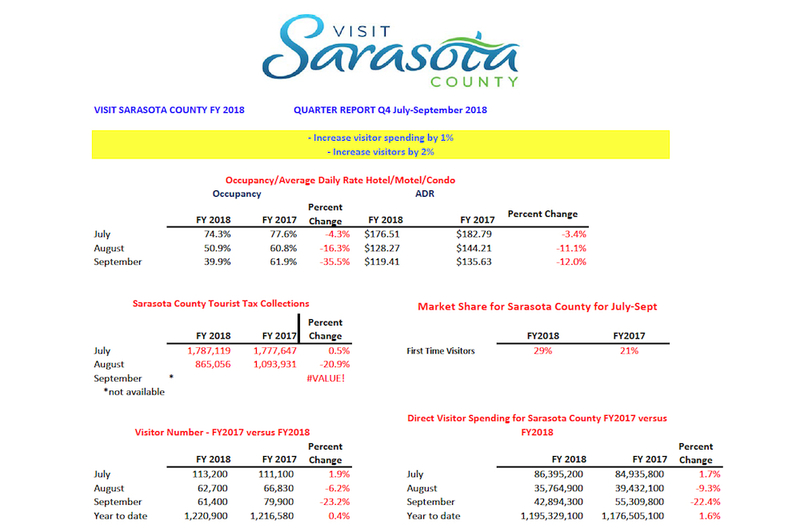 Data Visit Sarasota County (VSC) released for the fourth quarter of the 2018 fiscal year shows the September room occupancy was down 35.5% from the same month in 2017, and the average daily room rate was down 12% for that month year-over-year, to $135.63. Additionally, the VSC report shows a 23.2% drop in the number of visitors overall in September, compared to the figure for the same month in 2017. Overall visitor spending declined 22.4% year-over-year for that month. Nonetheless, the fourth quarter report shows a 0.4% increase in the total number of tourists for that quarter, compared to the same period in 2017, and a 1.6% uptick in their overall spending, year-over-year, for that quarter. The VSC figures are based on research undertaken on the office’s behalf by the consulting firm of Downs & St. Germain of Tallahassee. 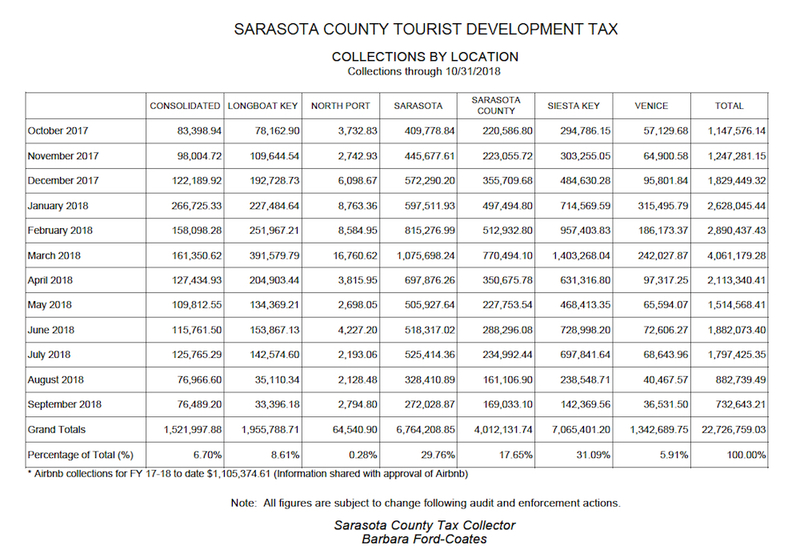 Among other data in the latest report from the Tax Collector’s Office, overall collections from Airbnb hosts for the 2018 fiscal year was $1,105,374.61, based on information the internet accommodations company provided to the office as required by an agreement inked between Airbnb and Sarasota County. The total is incorporated into the Tax Collector Office’s overall report each month. The Airbnb figure in the report through August was $1,034,034.61. As for location reporting countywide, Siesta Key once more came out on top, with businesses on the island accounting for 31.09% of total TDT revenue for the 2018 fiscal year. The city of Sarasota was in second place, with 29.76%. 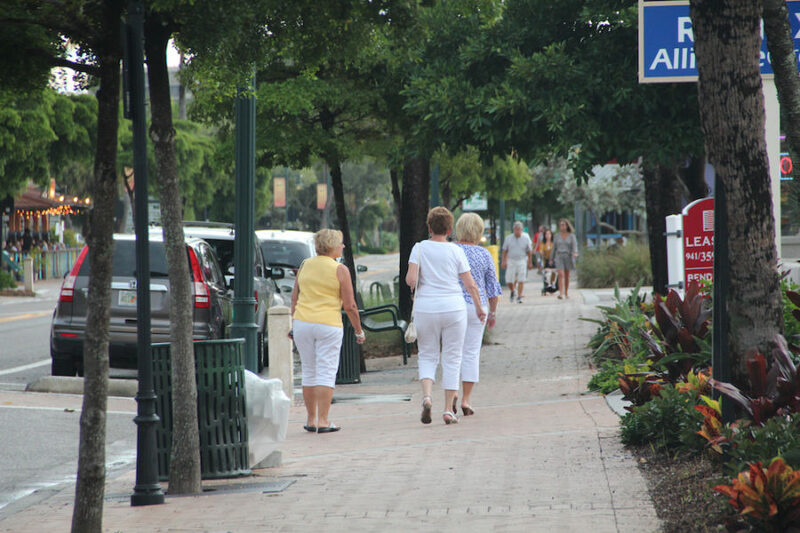 The city of North Port remained in its usual spot on the chart — last place — with 0.28%. North Port city commissioners and county commissioners believe that the relocation of the Atlanta Braves’ Spring Training operations to a new West Villages complex will lead to significant improvement in North Port’s TDT revenue position in coming years. The team will make a full transition to the West Villages during the 2020 season. In 2019, only the last Spring Training game will be held at the complex; Braves and community leaders said that would allow sufficient time for the new facilities to be completed.